LEN - www.lankaenews.com | Basil disillusioned over collision course with Gotler leaves country ! Basil disillusioned over collision course with Gotler leaves country ! 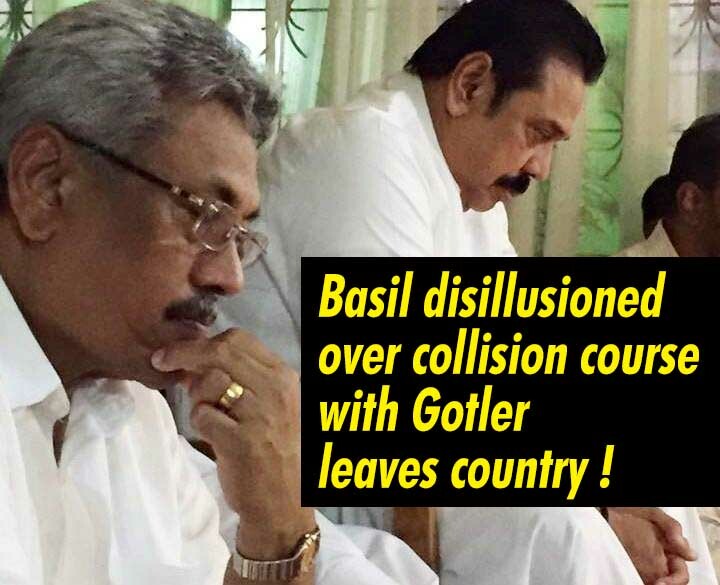 (Lanka e News – 26.July.2018, 10.45PM) Basil has already secured the court permission in this connection . A spokesman for Basil revealed the latter has decided to be out of the country for 3 to 4 months. Opposition in a quandary - Is opposition to become pro Rajapakse , democratic or extremists ? The controversy has deepened so much so that they say openly , as the individual named by Mahinda Rajapakse is decisive , there is no democracy . In such circumstances there is no political committee or district committee or family committee and it is primitive without any democratic character. If the name proposed by an individual is decisive , then what is fair and just about it? Even in a family the decision is that of the mother and father , and decision of a single individual is not implemented . If that is to happen the inevitable result is divorce. Even within a death donation society formed by the villagers, there exists no such stupid tangles or struggles for leadership. No matter who says what , the opinion of the Lotus bud group that they have no truck with the Bandaranaike Radalayas (noble)is a positive sign of Democracy. If the SLFP is to rise again or as Lotus bud , it must show positive signs of going beyond the confines of democracy which the UNP has offered to the people. Instead , seeking to glorify a single individual and boost his image is a most primitive move .Only a few in the opposition have understood that, others believe only in winning at coconut scraping , and dashing coconuts.. When ‘Gotlers’ are trying to use retired personnel of the forces , and if the leader of the Lotus Bud Basil Rajapakse without facing them is to leave the country allowing them to challenge those who are even little democratic , that is certainly not going to confer even minimum benefit on those who are pro democratic.